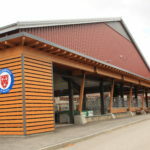 Holderness School, in Holderness, New Hampshire, was faced with a dilemma—their covered, outdoor ice arena had structural issues that would likely force the building to be demolished, requiring the school to build a brand new facility. The existing refrigeration plant was a turn-of-the-last-century ammonia design with Frick 8 x 8 and 7 x 7 compressors. Over time, the exposed headers and the Zamboni path created areas of frozen concrete, which caused additional structural issues. The local fire department also had concerns regarding the ammonia plant because their department was not Hazmat trained and relied heavily on emergency response teams in neighboring cities. In addition, buildings for school use were constructed less than 100 feet from the ammonia plant, and within 100 yards were a major road, intersection and interstate. 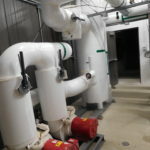 The school’s main goal was an energy efficient system that acted as a source of heat for the few rooms used as mechanical space, preheated the Zamboni water, and aided in the walkway snowmelt process. In the future, the adjoining sports building could be multi-use, but provision of glycol for air conditioning was required. 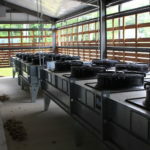 The school also wanted to conform to the local town wells and strict environmental concerns so the school greatly benefited in eliminating water for evaporative condensers and cooling towers. 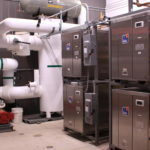 A modular chiller system does not occupy a large amount of space and only requires a small mechanical room. 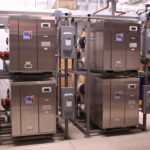 In addition, modular-style chillers work well with a solar installation, by utilizing small increments of electricity consumption during the enabling process, versus a larger standard refrigeration plant. 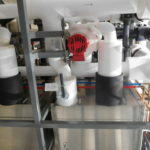 Preferred Mechanical Services provided a design in which four of Emerald Environmental Technologies ice3 Cubes were installed, totaling 84 TR (with future positioning and heat rejection inclusion for a fifth Cube if the building was ever enclosed). The facility layout was a partial wall, metal building with open sides, operating from October to March. Heated space for a Zamboni with an integrated snowmelt bunker, a refrigeration system, water heaters, and electric IT rooms were all required. 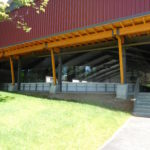 The arena’s external stairs required snowmelt and radiant heat, along with the concrete pad where the Zamboni drives onto the ice, mitigating a potentially dangerous slip hazard of ice forming on the walkway adjacent to the arena. 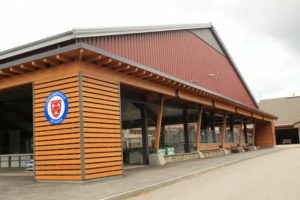 The ice3 Cube System also had dry coolers that were enclosed in a slatted exterior wall to hide them from view and allow maximum parking spaces for the facility. 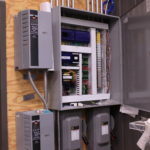 The benefits to this operator were the elimination of ammonia and large refrigerant charges. This brought a sigh of relief from the town’s Fire Chief to eliminate a potential Hazmat situation. 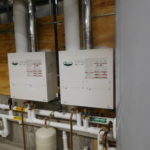 The simplicity of the Cubes and the ability to use reclaimed heat allowed for a simple installation and very limited propane usage. The ice3 Cubes came close to if not exceeding electrical usage of the ammonia plant. What surprised the operator was the capacity of the ice3 Cubes to allow for ice making when temperatures outdoors were actually 70*F. The dry coolers eliminated the need for water usage in cooling towers and chemical treatment that always bothered the operator as they are adjoining municipal wells. 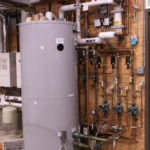 This was a win-win as it eliminated non-local vendors to treat the system as well as no ground water infiltration potential. It also allowed for a cleaner enclosed sightline on the building. 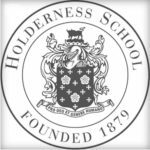 As Holderness School’s arena is a seasonal space, no energy penalty is acquired by the use of dry coolers. All heated spaces are maintained with radiant floors directly from the ice3 Cube system, and are backed up by the Zamboni water heaters. 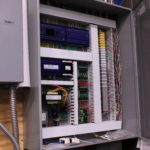 A Direct Digital Control system is employed to stage the ice3 Cubes, as well as operate the HVAC. 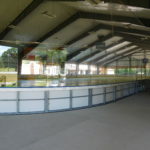 A Cube decoupler was installed to the cold floor where future AC can be sourced to a gymnasium that is adjoining the rink or in the event that the rink is ever fully enclosed. The now decoupled ice3 Cubes allow for less energy consumption by the cold floor pumps, as the restriction of the chiller is eliminated. The Cube decoupler, specifically designed for use by ice3 Cube systems, is an incorporation of the refrigerated cold floor to the Cubes. It acts to synthesize warm and cold glycols for the floor and the Cubes at different flow rates. After a few seasons the ice3 Cubes have become a low maintenance, consistant, non-event for the operator and staff. It is simplicity at its best.